So as you guys are well aware, I was very much absent from the blogging and reading scene much of last year. However, not all bad came out of that. Instead, I actually got to brunch to my hearts content for the past few months and am so excited to share these places with you guys! I am a mad brunch lover, possibly because it's the Melbourne in me, or mainly because it's another opportunity for me to update Instagram. Either way I just love food in general. It took me forever to actually try out Baba Sus but I was not disappointed. I actually ordered off the lunch menu, and the tofu dish was amazing. I'm kind of saddened that they don't have both the dishes we ordered on their menu anymore, but the Hong Kong Egg Waffles are worth going for. Whether you have a sweet tooth or not I would highly recommend you try it out! This little gem is actually located in Broadbeach, Queensland. 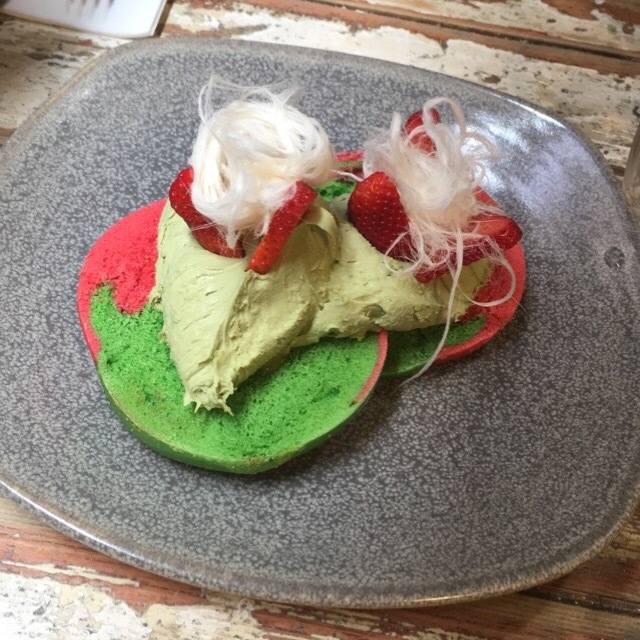 My best friend and I wanted to try out a brunch place whilst on holiday - again, I guess it's a Melbourne thing - and I am so glad we went here. 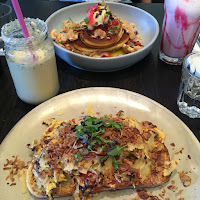 The cafe was a super cute, artsy place close to Broadbeach. The hash itself wasn't heavy, and I liked that the hollandaise sauce was the right acidity. Ordered: Slow Cooked Pulled Pork Shoulder Benedict, Smashed Peas Bruschetta , Sautéed Portobello Mushrooms and Cookies and Cream Donut Sliders. Despite having been here 3 times already I definitely would come back. I rarely go to the same brunch place more than twice, more because there are so many other places to try, but the menu offers variety and is an easy location to find. There's a homely, community feel to it and the food tastes fresh and flavoursome. I actually visited Penta today and already I want to go back and try out their Breakfast Bowl. I don't think the Chilli Scrambled Eggs lived up to my expectations - it lacked spice and had an overwhelming shallot taste. The Orange Blossom Hotcakes on the other hand, was so enjoyable. It the right amount of sweet and the orange flavour was refreshing. The French toast was so good, I would go back just for that, even though there is a lot more to try out on the menu. I don't drink coffee myself and anything too strong can be overwhelming but it's infused in such a subtle way that was very enjoyable. There is a lot of meat on this menu - I mean the name of the place speaks for itself - but despite that, I ordered the dish with the least meat. I absolutely loved it. The hotcakes were soft and tasted amazing with the bacon ice cream. I mean there were bacon pieces in the ice cream!!! Their egg dishes are great - I haven't tried a place that has had chilli scrambled eggs as good as Three Bags Full. The French toast was okay but I have had better before. Although I did like the addition of rhubarb because it gave a sharp, tangy taste to the sweetness of the toast. Axil just recently opened up on the ground floor of Chadstone Shopping Centre, which made it super handy to try out this famous brand originating from Hawthorn. Myself and three other friends tried out four dishes with the Baked Eggs being our choice of the four. The Red Velvet Pancakes were great for picture purposes but slightly too sweet to enjoy as the first meal of the day. I have to be honest and say I was underwhelmed with LBSS. At the same time though, I think I need to give the menu more of a chance. In fact the dishes are uniquely titled and very funny - they're named after famous celebrities. It's a small place, not super chic but I guess that adds to its character. We ordered a mix of brunch and lunch, but the location of this place is probably the one reason why I would revisit. It's local and offers a range of familiar dishes that would be able to satisfy any brunch craving but without the travel - at least for me. It's also right at the Hawthorn Football Club training ground so if you want to see any training sessions or even the players, head there. Known for: Bagels, bagels and ... more bagels. 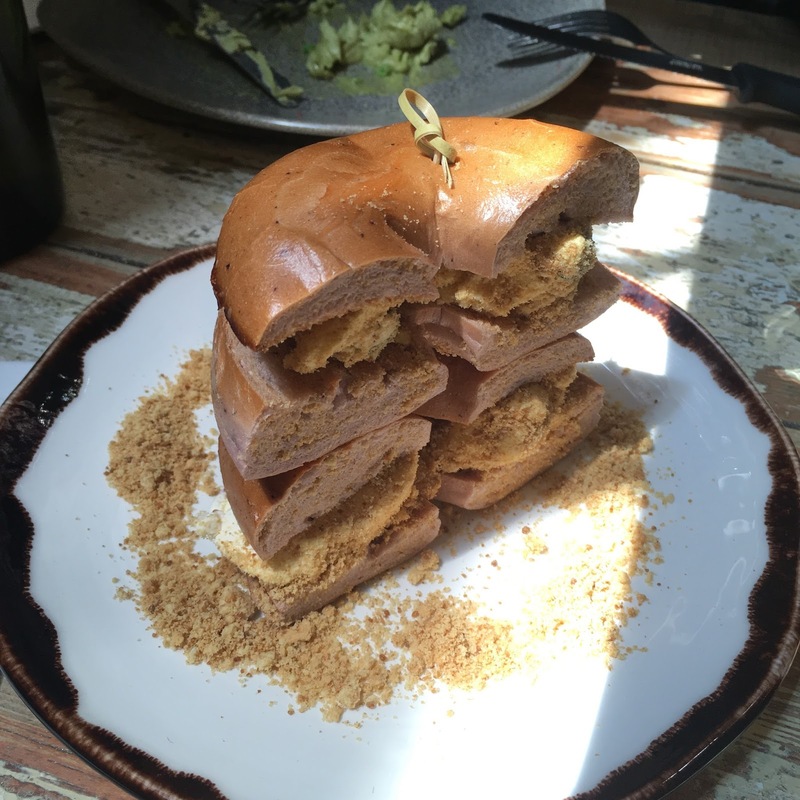 There's only so many bagels you can have, and really I would prefer to try other dishes and other places. Maybe it was because of how slow the service was, but I was left pretty dissatisfied with the food. The place itself is nice, with an outdoor area that's nice in the spring or summer. Again, another place that had a disappointing chilli scrambled eggs dish and really that was the one y thing I wanted to try on the menu. I have no idea what went wrong here but for one I barely ate any of the big breakfast and two I just don't think anything else will entice me to go back. Whether you're living in Melbourne or coming by one day, brunch is the number one thing to try. What's Your Favourite Brunch Place? Recommend Me A Place To Go!